Surrounded by snowy mountains and perched oceanside, even Vancouver’s business district manages to be idyllic. At the district’s Fairmont Pacific Rim Hotel, a fresh take on the hotel restaurant has bloomed by way of Botanist. The restaurant, which opened in the spring of 2017, focuses on the local bounty from this fertile region. Botanist’s dishes and design are elevated and sophisticated: a plaid-free take on the Pacific Northwest aesthetic. The interiors, dreamed up by local restaurant design darlings Ste. Marie Design, blend a creamy palette of blues, pinks, and neutrals with lush plants and dripping ivy. “It’s an interpretation of the Pacific Northwest, and rather than doing a West Coast Modernist approach, we wanted to look at the elemental qualities and the materials available here,” explains Craig Stanghetta, founder and principal at Ste. Marie who also worked with firm Glasfurd & Walker for Botanist’s identity. Those indigenous materials are prominent throughout the 5,000-square-foot space—limestone, bleached fir, and jade. The restaurant sits on the second floor, away from the busy lobby, with its main dining room, a private room, and a luxurious champagne lounge. The spaces are tethered together with the with a dutiful application of these materials, curvy geometrics, and soft light courtesy of gauzy window treatments. 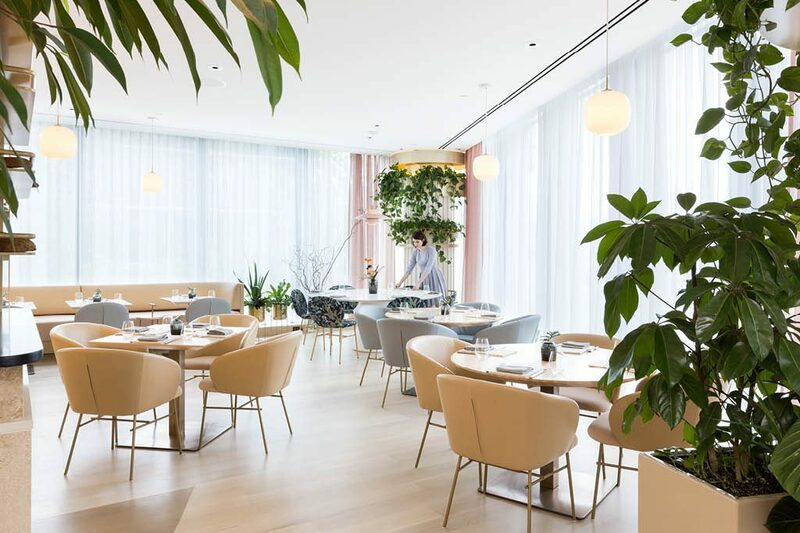 Botanist’s primary vegetal theme explodes in the Garden conservatory, where diners can dish on sumptuous Wagyu Zabuton steak surrounded by flora. Perhaps in replacement of that mid-day scotch, Botanist’s virtuous design inspires a fresh-squeezed juice instead.